Notes: Every year since I’ve started this here blog, I put “try fair isle” near the top of my annual resolutions list. I never do it (which is why you’ll notice I didn’t do a resolutions list this year). Last year I went as far as buying a bunch of yarn for some mittens for myself, but after trying twice, I put it away in frustration. 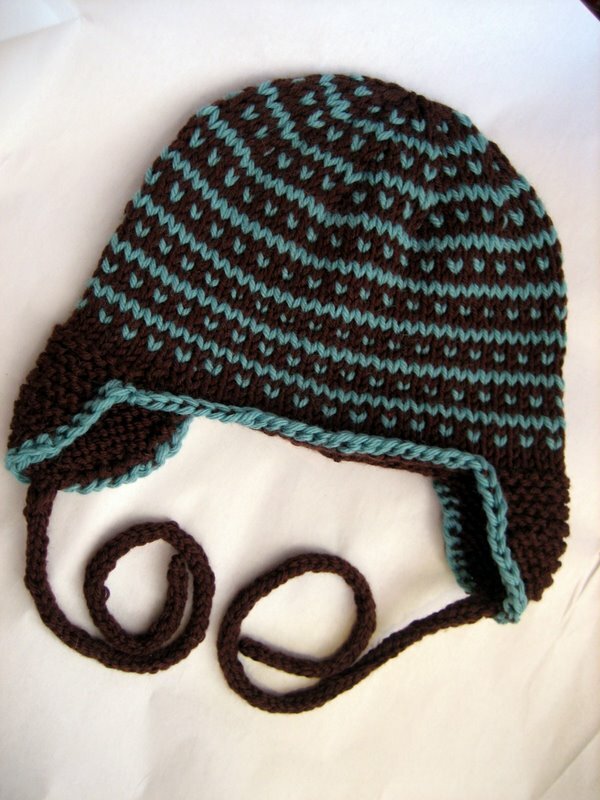 When I ended up needing only one skein of 220 heathers for the Yoda hat for my wee nephew, I returned it and decided that I’d buy a color that would work well with this pattern and the leftover brown superwash. The Yoda hat was such a hit that he, in all of his pre-verbal glory, made it clear to me that he needed an earflap, non-Yoda hat for the cold winters in upstate NY for Christmas. What could an aunt do but oblige? I sat down to try this hat, prepared for lots of cussing and frustration, and something miraculous happened: it just clicked. I knit this colorwork two-handed, just like Alice Starmore told me I should, and who am I to doubt her judgment? I’m not sure what happened to make it work this time when so many previous attempts failed, but it did. I’m not saying there aren’t wonky spots (third row up, I’m looking at you), and I’m not saying my gauge is perfect, but it’s passable, and it definitely made me want to try again. When you get into a groove, colorwork is really fun! I knitted this according to pattern, with two mods: I did the single crochet border in the CC, and I knitted i-cord ties as requested to keep the hat firmly on squirmy baby head. I also left off the pompom because, as it turns out, I cannot make a pompom to save my life. The pattern is fun and simple, and definitely a great one for colorwork newbs like myself. I’ve now tried felting and colorwork for the wee nephew, as well as knitted at least my height in i-cord. If that’s not proof that Auntie Mickles loves him, I’m not sure what is. amazing. way to cross something off the resolution list. IN JANUARY. looks great! That is a very successful fair isle project. Really cute. Lovely! I’d say you and fair isle are a match made in heaven.